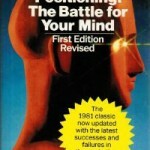 – Al Ries & Jack Trout in Positioning: The Battle for Your Mind. Just about everything you’ve done in marketing in your early startup stages was a warm-up. Marketing takes a whole new meaning after you’ve scaled-up to the point where your brand needs to be out there and mean something. If you have experienced incredible growth as a consumer startup, or if you’re about to reach 100 customers as a SaaS/B2B company, your brand position will become increasingly important in helping you stay successful. But don’t be fooled if marketing probably didn’t play a big role in getting you there, initially. When all products are great, when all VCs are really good, when all teams are amazing, when customer/user acquisition is working great, what ends-up differentiating the winners from the rest? More specifically, companies that understand how to master the art of communicating their position will win. And the best form of communications is positioning. When you’re starting out, you don’t need much positioning, because you’re still aspiring to become whoever you want to be (when you grow-up). What you need at the beginning is good enough messaging to get users to try your product. So don’t confuse messaging with positioning. but it is not what you do to a product. Positioning is what you do to the mind of the prospect. This means that you position the product in the mind of the prospect. It’s like thinking in reverse. Instead of starting with yourself, you start with the mind of the prospect. Positioning is the first body of thought that comes to grips with the difficult problem of getting heard in our over-communicated society and over-published online web. In the same way that you believed in the “thin edge of the wedge” to get your product through the trial door, in communication, less is more. You have to sharpen your message to cut into the mind. 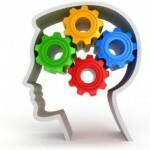 Each day, thousands of blog posts, tweets and other social/online messages compete for a share of your mind. 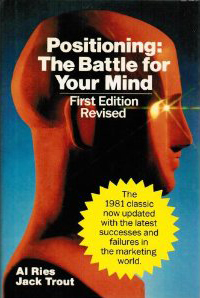 So, the mind is the battleground, and positioning is a systematic solution for finding a window in the mind. Back in the 80’s & 90’s no CIO ever got fired for choosing IBM at large companies, because IBM owned the position of being a safe choice with peace of mind and consistent support. They were always there with you. Fast forward to 2013, and there are some new web companies that are beginning to occupy similar positions in our minds. For a startup, you can’t go wrong if you chose the Amazon Web Services cloud-hosting environment. Although they could be more expensive in the long term, their deployment and management tools make it very easy to start with. Amazon understood well how to lower the on-boarding barrier, something that startups really appreciate. Although Rackspace is a fine company with great services as well, they are a bit like Avis. Being #2, they have to try a little harder. If you don’t communicate daily, how can you let your ideas cut through the sea of content noise?When you blog, you communicate. This is why those who blog regularly are rewarded by earning the position they re-enforce in the minds of their readers. And the best part about blogging is that any user can take your message and amplify it via other blogs or on social media. That couldn’t be done in advertising literally speaking, i.e. you don’t take a billboard and show it to your friends. There is chaos already in the communication spaces that we come across, both online and offline. Prior to online, the average consumer would come across one or two newspapers and a handful of magazine articles per day. Now, we are constantly consuming stories, blog posts, articles and social messages perhaps seeing 100+ headlines per day. We end-up clicking on 15-25 of them, and maybe sharing another 5-10. Choose your words carefully because words move people, but they can also cause indifference. Not all words have meanings just because the dictionary says so. In marketing, the meanings are in the people using the words. If you take the analogy of the sugar bowl as the container, and the sugar as the meaning, you fill the words (container) with meaning (sugar). A word has no positioning significance until you or someone fills it with meaning. If you add sugar to a leaky bowl, you won’t get anywhere. So, if you try to add meaning to a leaky word, that won’t work. Better to discard the leaky word and use another one. 4. What will you sacrifice? The other side of the coin for the thin edge of the wedge metaphor is: “what will you sacrifice”? You must be willing to give-up something to establish that unique position. You can’t be all things to all people and still have a powerful position to defend, unless you’re a big company already. Not all companies are Facebook. Nyquil, the nighttime cold medicine, gave up the daytime market. Positioning also has defensive purposes. A company that wants to be long lasting has to develop a position for itself, as a defensive measure. Once you occupy that position in the mind, you become somewhat protected from the inevitable vulnerabilities that come along the way; for example when some of your products are bad or new releases aren’t performing as well as expected. A classical example is Apple who has done an amazing job building their brand at the edge of fantasy and reality. Their extraordinary marketing helped to create a position in our mind where we romance their products and forgive them a lot. When you love someone (or something), you will put up with imperfections and overlook them in favor of the other good stuff. Apple Maps not perfect? No problem, we believe they’ll fix it. Antenna issues? It didn’t affect me, so it’s not an issue. iTunes is clunky and expensive? That’s ok, there is variety instead. You get the idea. It’s hard to defeat a fantasy. A sign of startup maturity is when you can confidently dissociate your product from your company for marketing and sustainability purposes. When you start to talk about what your company stands for, that becomes a powerful driving force for your evolution. In a comments exchange on Fred Wilson’s blog in a post entitled Tenacity and Persistence, I asked Scott Heiferman, CEO and co-founder of Meetup about what Meetup stood for. His response was very telling about the kind of company Meetup is. It turns out that Meetup has a higher cause than collecting $15/month from meeting organizers. The Meetup higher cause mission is amazing and it’s a very good thing, but it struck me that it was under-marketed or not as sharply communicated. But first, make sure that you can’t find something to be first in. It’s better to be a big fish in a small pond (and then increase the size of the pond) than to be a small fish in a big pond. SendGrid took the position of being known for easier and deeper understanding of email integration as a way to enter the email marketing market. They didn’t start by saying they had a better product than MailChimp who was already the leader. SendGrid is now a very strong #2, a very honorable market position. Assume for a minute that the online world didn’t exist. And assume for a moment that your virality will run its course. As long as we live in a physical world, the marketing battle for the mind will need to transfer parts of its focus into the physical world and into non-organic viral methods. For 2 reasons. First, to solidify and protect your position (see point #5 above). Second, in order to attract the next wave of your users/customers who couldn’t be reached via online viral tactics. Your first 1, 10 or 30 million users may have come from online virality, but you may need to tap your next 9, 90 or 270 million via non-viral methods. I’m not advocating expensive TV or bus commercials , but there are ways to let your brand become known out there such that it is driving new users for you from offline to online. Twitter, Facebook, Zynga and Instagram had incredible viral elements at their core. They are great examples but they are not easily copiable by reverse-engineering how they got there. You need to find your own path and break-away points, but you can be sure that a large part of their growth came from people talking about them in the offline world (via word-of-mouth) and that drove additional online users for them. I believe we are seeing a renaissance in the positioning era. Now is the time to think about what kind of assault on the mind your company is going to undertake in order to secure its position. When you do that, make sure that you create a position in the prospect’s mind that takes into consideration not only your strengths and weaknesses, but also those of your competitors as well. For startups and grownups, marketing positioning is a key battle. Find the position you want to occupy; own it and let it inspire users to keep you in their hearts and minds forever. Let them think of your position before they think about your product. Mind, by Al Ries and Jack Trout. That book was written in 1981, and it is a marketing classic. I added my own context for startups and companies experiencing hyper-growth, in addition to modernizing some of its concepts to reflect the current online realities. The book’s original direction focused on advertising as the method of communicating a brand’s position in the marketplace. But today, the blog post is arguably the new Ad unit of today’s world which is dominated by online influences. Therefore, much of the basics of these principles (with my adjustments) squarely apply.